It’s a well know cartoon by Sidney Harris. Two scientists are gazing at an immense blackboard filled from top to bottom with a complicated formula filled with mathematical equations and process jargon and symbols. 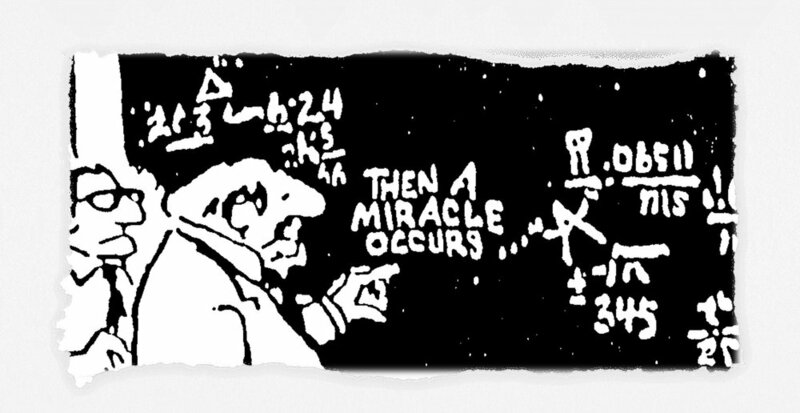 One of the scientists points to an area of the blackboard where the process states, “Then a Miracle Occurs.” He explains to his partner, “I think we need to be more explicit here in step two.” I can’t but laugh every time and yet it’s so profoundly true it makes me shudder. Our whole Systems Engineering profession is build around decomposition, implementation, integration and verification. And so this mystery (or miracle) of emergence is just assumed or taken for granted. I teach this stuff at the graduate level and even I am unsure how to explain why properties and/or capabilities will emerge when you put together components of a system. Even though these various individual pieces have none of the properties and/or capabilities of the larger system. It just happens. My interest in emergence came about when I was exploring the phenomenon of "Unintended Consequences." I wanted to know if there was a way we could plan and manage these unexpected results of our system development efforts. “Unintended Consequences” are basically unwanted emergent properties. And just like the senseless task of looking for an “unknown, unknown” risk, how can you predict the unpredictable? You can’t, but you can at least appreciate the mystery unfolding before your very eyes. There is an excellent book appropriately called, Emergence: The Connected Lives of Ants, Brains, Cities, and Software, by Steven Johnson which explores this topic in detail from a more societal point of view. By the way, another really great exploration of Emergence was also done by one of my favorite radio show and podcast, “Radio Lab.” It's well worth a listen.